Because assessment and instruction are two sides of the same coin, it is critical for teachers to not only assess what students understand, but also use that information to adjust their teaching. Assessment-Centered Teaching (ACT) is a unique practice that allows teachers to gather information during instruction to uncover learning gaps and guide students toward deeper understandings of complex ideas. Assessment-Centered Teaching helps teachers, professional developers, and school teams establish quality instructional goals and implement ongoing formative assessment to promote student success. Formative assessment is comprehensive, interactive, and a model of mastery learning, in which a student develops skills and confidence under the guidance of a seasoned professional. 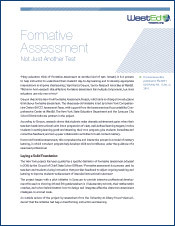 New York's Formative Assessment Project aims to change how educators think about formative assessment. Assessment-Centered Teaching: A Reflective Practice for Science Formative AssessmentLearn and implement science formative assessment practices to find out what your students, K-12, really know.